We have three routes ––each less than 10 miles long–– and a grand tour. Download individual route maps, or pick one up at the event start, or use on-online guidance. • Yellow Route: Downtown Palo Alto, Menlo Park, El Camino Park, and California Ave. This route takes you on the first Bike Boulevard in the country to downtown parks with the first stop at Heritage Park. 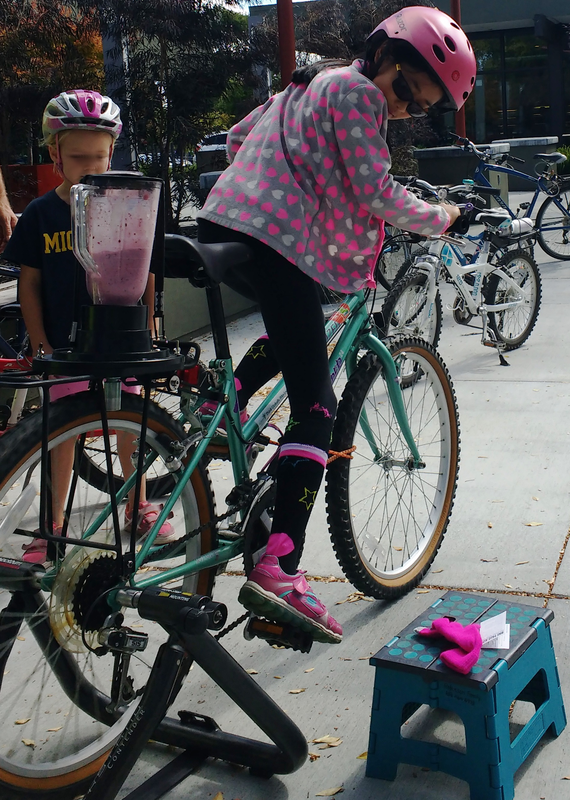 Continue to a bridge over San Francisquito Creek to Burgess Park in Menlo Park, where you can enjoy a blender bike smoothie! Return over a different bike bridge, next to Palo Alto’s namesake tree at El Palo Alto Park. Enjoy the two-way bike path through El Camino Park. Walk your bike inside the Palo Alto train station. Use the bike path along CalTrain to Churchill Avenue. Go through the Southgate neighborhood to the final treat stop: at the fountain near Cal Ave Caltrain station. Return via the Cal Ave. tunnel to Bryant and back to Fairmeadow School. • Blue Route: YMCA, Edgewood Plaza, and Baylands EcoCenter. The first treat stop is at the Ross Road YMCA. Continue on the Ross Road Bike Boulevard to cross at Oregon Expressway and use Garland to access Middlefield and our city’s first protected two way bike lane. Turn right to pass Greene Middle School (formerly Jordan). Take Newell, then Channing to reach the second treat stop at Edgewood Plaza. Cross Embarcadero Road and continue on St. Francis Drive to the bike/ped bridge over US101. Follow arrows to the the third treat stop at the Baylands EcoCenter, where the Environmental Volunteers will host an open house and you can help create a blender bike smoothie! Head back along the multi-use path next to East Bayshore with the wind at your back. Use the seasonal US101 undercrossing at Adobe Creek, then return to East Meadow Drive. Continue to Ramos Park and then to Mitchell Park on your way back to Fairmeadow School. Red Route: Robles Park, Los Altos, Barron Park, California Ave. Bike west on Meadow from Fairmeadow School to Wilkie Way, and then to Robles Park. Then take the bike bridge across Adobe Creek, and discover a secret passage off of Monroe Drive. This leads to Los Altos Avenue. Continue to the Sweet Shop for a sample of their frozen yogurt. Return to Palo Alto via a connecting bike path to Arastradero Road; cross at a signal near Gunn High School. Go west along Arastradero. Just before Miranda Avenue turn right onto Bol Park Bike path, past the donkey pasture to the third treat stop in Bol Park. Continue on the path to Hanover Street and head north to College Terrace. (Notice a lovely view of Hoover Tower.) Turn right on Stanford Avenue, cross El Camino Real, and continue to the fountain near Cal Ave Caltrain station. Have a treat there then head back to Fairmeadow School via the California Avenue tunnel. The Grand Tour! For more experienced riders; not fully marked, so we recommend using Ride With GPS guidance. This 17.5 mile route covers most of the rest stops and a majority of the bike paths/routes/access points along the way. As treat stops close at 4 p.m., we recommend that Grand Tour riders start before 2:00 pm. We also recommend following this route in a clockwise direction.